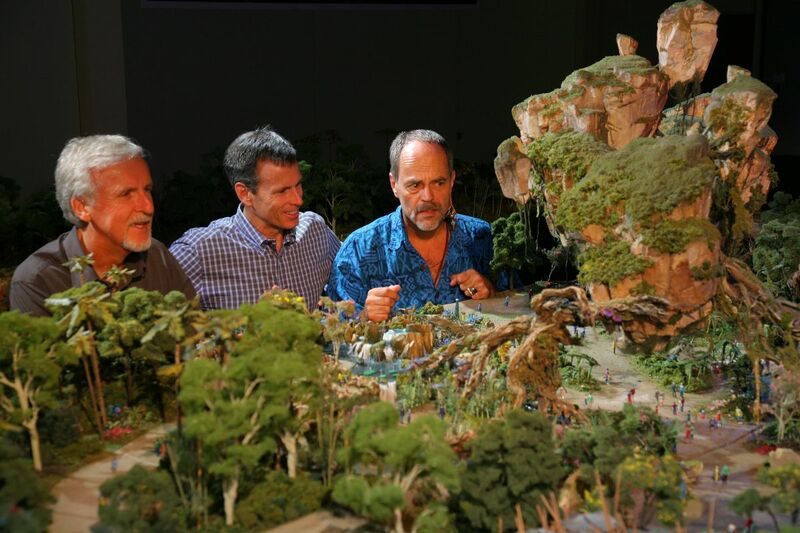 It’s been just a little over two years since we received word that Disney’s Animal Kingdom would get an entire land based around the blockbuster movie Avatar, bringing to life the mythical world of Pandora. Today, via the D23 Expo in Japan, Disney finally released a bit of what this world will actually look like when it comes to fruition. Pandora will be a place where guests become immersed in the world that was created for the big screen. They will be able to not only see this world, but hear and touch it. In the world of Avatar, guests will encounter floating mountains, as well as explore a nighttime jungle of bioluminescent plants that are alive with light and sound. The area is absolutely gorgeous and full of an illuminating rainbow of color. Guests will also find out what it feels like to soar into the sky riding a Banshee. 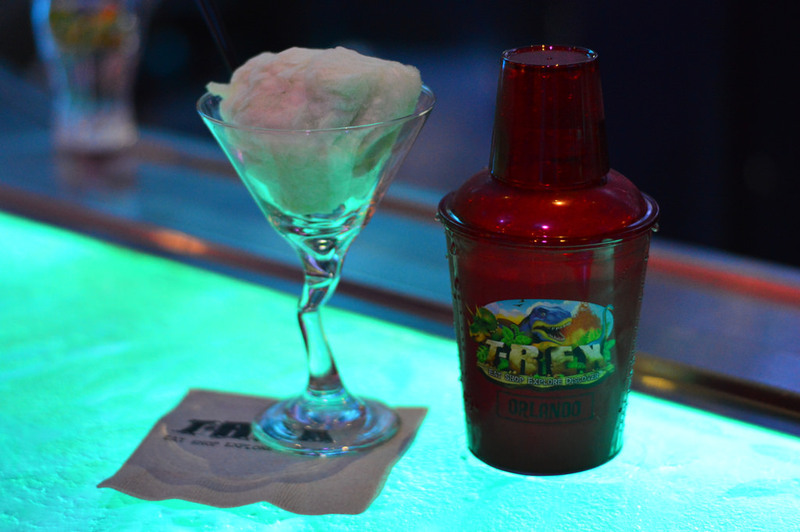 In addition, Disney’s Animal Kingdom will also see a few more perks. The park will FINALLY, after 15 years, receive a brand new nighttime spectacular. This showcase will come to life on Discovery River and combine live music, floating lanterns, water screens, and swirling animal imagery. 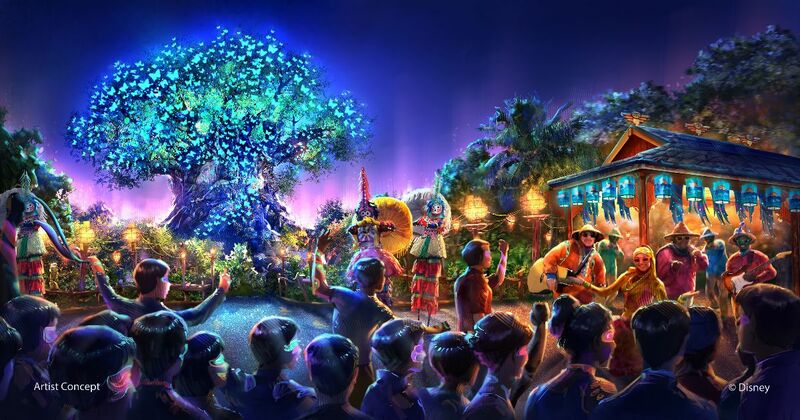 Additional entertainment offerings will also be introduced, including live performances that take place on Discovery Island. Also, it seems that a brand new nighttime version of Kilimanjaro Safaris will be available for guests to experience. Disney confirmed that the world of Avatar is overtaking the Camp Minnie-Mickey section of the park. A new theater for the popular Festival of the Lion King is under construction in the Africa section. Update: According to Tom Staggs, Chairman of the Walt Disney Parks and Resorts, this new world is expected to open early 2017. It looks like a lot of interesting activity is brewing for Disney’s Animal Kingdom in the upcoming years. Stay tuned to the blog as we watch the progress of making Animal Kingdom even better! Don’t care a wit about Avatar but about time we get something after dark in the AK! Avatar is a great – if not somewhat forgotten – movie. I’m surprised the plans for Avatarland haven’t been killed off but do think it’ll be a very cool addition to Animal Kingdom. Glad they are doing SOMETHING with that dead river! I saw the movie on DVD and wasn ‘t impressed. Friends it was the big screen and special effects that made the movie, not so much the story. So, Disney, bring out the story more! So I guess they are extending hours. Wow, I can’t believe they are sticking with this. I expected (and hoped) it would quietly die off. Not to beat a dead unicorn, but I wish they’d stuck with Beastly Kingdom. I get that an existing property is probably easier and cheaper to work with but picking a four year old movie with no enduring fan base, off-putting character design, and a weak plot makes Disney seem desperate and out of touch. 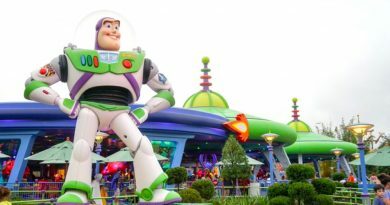 Disney is giving us new attractions and that is a good thing even is we don’t like the theme. I’m just grateful they are investing in the oak going experience. Why whine over it. I’m happy to see nighttime entertainment. As for these new rides, I hope we all live long enough to see it. Tom Skaggs just commented on the Disney blog that they hope to have it open in 2017. I think it will be very cool. I love Animal Kingdom because of the ANIMALS. The ecological themes of Avatar will fit in perfectly. Some people just dont get it. Can’t wait! I could care less about the movie, but I think it will provide for amazing content and atmosphere. If the end result looks anything like the concept art, this will be a truly amazing addition. I am both excited and nervous at the same time. While I am not an Avatar fan, it will be nice to have some new attractions plus the evening entertainment sounds amazing. However, I wonder if this will have any effect on the animals who are used to a certain schedule. Also I read they are planning on a few sequels to the Avatar movie. I’m sure they are hoping the buzz from the new movies will translate into park attendance. I sincerely do not understand why this is still going on. Why are they putting resources into this when they could be making a Star Wars land? They are in desperate need of something to compete with Harry Potter, and this is their answer? It makes absolutely no sense. This movie has a small, cult fanbase, yes. But it’s not a big enough fanbase for an entire land. Meanwhile, they have the rights to Star Wars now. They’re even making another movie! Why let this idea sit in the dark? They already have a ride at the Studios, all they need to do is expand it! Star Wars is an actual franchise that, while not as huge as Harry Potter, could put up a decent fight! I assumed they base this off of box office money, which I just want to point out that Avatar made $760,505,847. ONLY the top three Star Wars movies made collectively a little over 1,000,000,000. And they were all in the top twenty of IMDB’s top box office list. The first one, Star Wars, was made in 1977. It is the oldest movie in the top twenty and is still there. Further down, Star Wars movies dot the list one after the other. And what other movie franchise takes over the top box office list? Oh, yeah. Harry Potter. Well, Star Wars in DAK makes no sense, which is why all the Rumours have SW expansions in DHS & DL. While puzzled when they got Avatar, unless they base a ride/land on something I actively dislike, the ONLY thing I care about is “Is it good?”. All that matters. For instance, although I think SW’s films, while entertaining are vastly overrated. However, I think Star Tours is the best simulator ride around. I used to really like Stargate SG1, but a sim ride of it some years back in 6F, etc, was awful. The source of the ride never matters to me; I only care about whether the ride is good & something I want to ride again. As for night time and animals, I don’t think it’s an oversight that there was no mention of Fireworks. SWL is going to be made. They teased about it at the D23 Expo. :D! Regardless, whether a fan of Avatar or not, it’d be foolish to say that walking THRU a massive/towering PANDORA won’t be IMPRESSIVE. -how will that not add to the MAGICAL experience? Pandora is the stuff of *dreams* (granted, movie didn’t have many original ideas, and story was Fern Gully: Remix, but still lol). Not a fan of Avatar it will be interesting if the second movie can reproduce the box office gate of the first. If it doesn’t Disney may have seriously miscalculated. Heck they could have tied Beastly Kingdom into Asgard in some way and tied this land into Thor. At least they already owned that franchise.